This year, my favorite Christmas present was from Johanna. Pretty, isn’t it? But that isn’t why I love it so much. And it’s not like I don’t have 47 ESV Bibles lying around my room. I’d nearly covered all the colors of the rainbow: black, pink, blue… No, the point is not the Bible itself, but the heart that gave it. Neatly folded and tucked inside the Bible was an article by Noel Piper entitled “Never In January”. 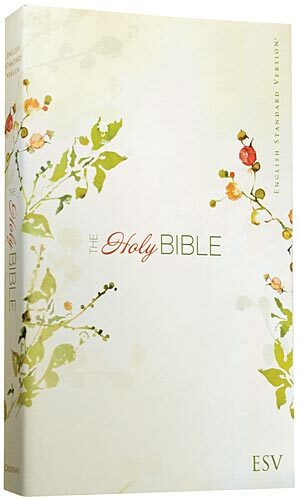 In it, she talks about the fight for faithfulness and fruitfulness in daily Bible reading. I’ve gone through Crossway’s “Every Day In The Word” reading plan at least twice. I loved it and if you’ve never done a similar plan, I recommend it. But I think halfway through my third time through, I realized I had to do something else. My time with the Lord was becoming so routine. “OT: check, NT: check, Psalms: check, Proverbs: check. Okay, fulfilled my righteousness quota for the day.” Ouch. What was once a good routine had become legalism. I inherently assumed I was earning favor with God by the time I spent daily with him, and looked down on people who didn’t. Disgusting Pharasaism. I had to repent and mix it up. Since then, I’ve had sweet times with the Lord in experiencing freedom in my study time. I can read where I need to read instead of where I’ve planned to read. But I took that too far as well… and soon became lax in my reading, skipping a few days, and eventually, not reading at all. Before I knew it, I was spiritually starved and essentially saying to God, in my neglect of prayer and time spent with Him in the Word, “Sorry, don’t have time for you. I can make it on my own, thanks.” Abominable Godless behavior. I was very soon becoming a spiritual zombie and I’m thankful beyond words for friends who noticed and spoke up. It inspired me. It challeneged me. Why am I reading the Bible? What’s the point? What’s the focus? What’s the fruit? If I’m reading the Bible just because it’s a good Christian thing to do, then I’m treading dangerously legalistic waters. If I’m only reading when I feel like it, then I’m saying I only need Jesus sometimes and believing the lies that say ________ is more important/sweet/enjoyable than spending intimate time with God in His Word. Either way, I’m cheating myself. So – what’s my daily Bible reading philosophy now? Just read something. A verse, a chapter, a whole book, in chronological order, or whatever you want. But do it. And do it purposefully. I’m hunting for God’s faithfulness with a pink highlighter and I started in Genesis. If I feel like I need to read James or Psalms or Hosea, then I do. If I don’t feel led to read anything in particular, then I go right back to Genesis. And regardless, I pray for open eyes to see His faithfulness and trust He’ll bring the fruit in it’s season. What about you? What are you hunting for? thank you katie :) when i write on my blog i wonder if people read it and then i wonder if the people who are reading it are actually getting it. then i read your blog and i can see that you get it. you get what the Bible is about, what Christian hedonism is about, and what we as Christians must be striving for: to know God better and more intimately than the day before. so, thank you. you have encouraged my heart and challenged me to know God more for the Savior that He is. Thanks, Emilie. :) I am sincerely overjoyed that my stumbling failures can encourage and challenge you. Really. PS: I read your blog and I love it. And as of today, you are overdue. What’s on your mind/heart? And what’s the people group of the week? AFter a long break I just spent naptime catching up in reading past blogs. Thank you for sharing what God is doing with you in such a personal way. I am inspired today reading that it is all tooo common for our quiet times to become too quiet and listless. Thanks to Johanna for sharing Noel Pipers letter. I am going to find a highlighter right now… and be with His help an enthusiastic hunter. And boldly sing that I want to know more about my Lord.